If you are a Filipino anywhere in the world who has an online BDO account, and want to start investing in the Philippine stock market, then you are just few clicks away from buying your first stock. This is after BDO Nomura Securities Inc. opened its doors to small retail investors, allowing opening of Philippine stock market trading account all online. BDO Nomura is a result of joint venture of the Philippine’s largest bank BDO Unibank Inc and Japan’s Nomura Holdings Inc. The deal has renamed PCIB Securities, a securities dealer and broker with a seat in the Philippine Stock Exchange, to BDO Nomura Securities Inc. PCIB Securities was one of the subsidiaries acquired by BDO years ago when it merged with Equitable PCI Bank resulting to its rising as the country’s largest bank then. 1. You can apply, fund your account and trade all online – no need to go to the branch! 3. You get the latest market news and research, delivered, daily, weekly and monthly; useful for any type of investors – from beginners and experts. Opening a trading account is very easy as long as you already have an online BDO banking account. The fact that you already have an active BDO banking account made it possible for you to open a trading account all online without the need for personal appearance. That means no hassle for you in printing and submission of physical application forms which are very common challenges for Pinoys based abroad or those living in the provinces far from central cities. All you need to have is an access to internet and an active online BDO banking account. Again, the steps below assumes that you already have an online BDO banking account. This is important since you will be using your online BDO banking user ID when logging in to BDO Nomura trading platform. If you don’t have this yet, then do this preliminary step first. 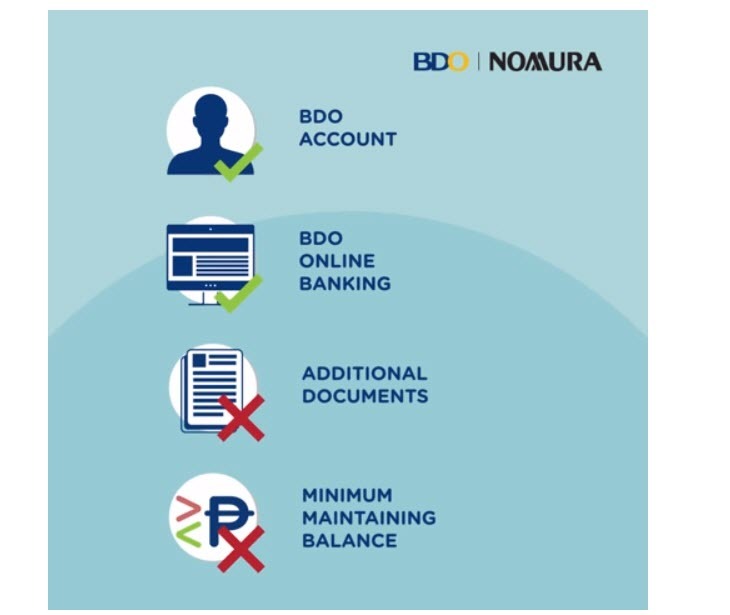 STEP 1: Go to BDO Nomura website – https://www.bdo.com.ph/bdonomura and click in the upper right hand corner the Online Trading > Enroll Now. STEP 2: Log-in using your BDO Online Banking User ID and password. STEP 3: Enter the one-time password (OTP) you received via SMS on your mobile phone. STEP 4: You will be able to read the Instruction and Consent form . Just tick the “I have read fully understand…” box. STEP 5: Click on I Agree in the Terms and Conditions in the next screen. STEP 6: You will then need to fill out the Investor Profile and Suitability form. Just provide all the answer needed and click Next. STEP 7: Re-type the displayed CAPTCHA code, then click Submit. Review the details provided in the next screen and click Confirm. Just wait for the approval of your application which will be sent to your email. Another email will be sent to you the next working day indicating your Control Code. This control code is an additional security check you use when buying or selling stocks. Once you receive this email containing your control code, you can log-in back again and you will be prompted to change your control code in your first log-on. Once your account is all set, you can now proceed to the next stage of stocks investing which is funding your trading account to buy your first stock. You can do funding of your BDO Nomura trading account through your BDO Nomura Settelement Account. To see your assigned BDO Nomura Settlement Account Number, login to www.bdo.com.ph/bdonomura using your BDO Online Banking user id and password. Go to the Deposit/Funding Menu and your assigned Settlement Account Number is already displayed in the “Transfer to” field (see below illustration). You may already fund your Settlement Account through this facility should you wish to add trading buying power. Once your trading account has enough funds, you are then ready to buy your first stock! Yahoooo! Currently, BDO Nomura uses what is called as PSETradex Explore. It’s a web-based trading terminal that allows its users easy access to a wide array of market and stock information and quick trading actions. Some of its features include Watch list, stock info and charts, portfolio monitoring and tracker records. Below is a sample actual transaction for buying 110 shares of Metrobank (stock code MBT). And just like other stockbrokers, you will also be receiving via email a confirmation notice of every matched buy or sell order you made, with breakdown of expenses. For breakdown of fees and commissions, you can read this post: Costs of Trading in Philippine Stock Exchange. Once you have bought your first stock, you can then see your stock portfolio on homepage each time you log-in, as shown below. To see the actual gain or loss, you need to click Trade to go to the trading platform where you make your buy/sell order. For my first stock transaction above, my 110 shares of MBT as of 04-11-2017 has gone up by 1.47% which is equivalent to unrealized gain of 137 pesos (still better than banks’ returns) :). BDO Nomura also sends Monthly Statement of Account as an attachment via email to give you a summary of your account and stock holdings every end of the month. It’s a good habit to save this as part of your record keeping. Selling your stocks will go through a process similar to when you buy it. This selling is necessary to convert your stocks to cash which in turn you can withdraw. I guess the best thing about this BDO Nomura tie-up with BDO is the cashless transactions you can make if you already have BDO account. Their researches though still has a lot to improve compared to other online brokers but I believe it will soon catch-up in its services with time. In case you have other questions, you can send it to their support team using their contact page or maybe check first their FAQ’s. If you have more general starter’s questions, you can also send me email via my contact form here. HI! i forgot my log in name and PW in my BDO Nomura account, do i need to register again. Hi Gem, it’s the same password and username with your BDO account, so just try the “forgot password” options available to recover your account. i forgot the trading code, where should i request to retrieve it? Same here, i wasn’t able to receive any email from pse. How do i change the trading pin code? Hi Sir Omeng, Nkareceive po aq ng email from PSETRADEX forgot pin pero d ko p nrerrceive un onlinetrading application approval q from BDO Nomura. You can email bdo nomura support for assistance Joemar. hi omeng, ask ko lng pano pla ung pgbabayad ng tax sa mga investments? wla ksi ako sa pinas. How long before trade balance shows from the date of funding? I have funded the account yesterday at 2pm. Received the confirmation over e-mail and until now my balance shows 0 in their trading site. Should be after one trading/banking day. hi I cant change my control code number .. that’s why nag pasok na lng muna ako ng pera kelangan bang ichange agad un ? Hi Ivan. there may be some changes in the process flow, so it may no longer be needed. As long as you can buy / sell stocks with the bdo nomura platform, it should be fine. Hello po. I love reading this blog because I’m really interested investing in stock market. ask ko lang is which is better, apply in COL financial or use this BDO Nomura? Hello Serj, BDO Nomura is relatively new so its features are comparably less versus other first players like COL Financial. But this is a quick option if one has BDO account enrolled online already as no physical documents need to be submitted, which most brokers like COL Financial require. Can you still open nomura trading even if you dont have bdo savings account? Thank you. Hi Candice, you will need to open an account first with BDO before you can open a trading account with BDO Nomura. It’ s a requirement. You can open a BDO account with as low as 2k maintaining balance. Hello Robert they don’t have mobile app yet. So you have to use your internet browser app and go to BDO Nomura website to do you stock trading / investing transactions. Great Blog! Just want to ask if it is possible to change the beneficiary account once you are enrolled in BDO Nomura? For example i have 2 savings account and when i enrolled i use the account number one as source or beneficiary account but now i want to switch it and intend to use the second account of mine, is it possible? Thank You in Advance! Hi Janilo, unsure of that. You can contact them directly to be safe. Hi Omeng, if I want to sell my stocks to get cash, do I have to wait until someone buys the stocks I posted for selling, before the money gets into my trading account? Richard, yes, your selling order has to be matched first with a buy order at the same price you gave. and so the matching is less of a problem. Hi, thanks for sharing, just like to ask what is the “settlement date” from the confirmation notice after I successfully bought stocks. There is a trade date and settlement date. Thank you. Settlement date is three banking days after the trade date. This is relevant for bank clearing purposes. For a retail common investor, this is the date when your selling proceeds becomes “cleared”, meaning available for withdrawal. Hi Rea, should be one to three days after your online application for BDO Nomura. Hi! Just a quick question 🙂 Will we still be able to choose what account type we want if we’ll register using bdo acct? Hello Lenie, BDO Nomura accounts are all the same. As of now, no such thing as account type for trading accounts. I am looking for a good way on how to invest ,it so happened that i’ve read your article. Hi Mary, Yes BDO Nomura this should be available with any BDO branch, but you can actually open a trading account without going through their branch, and just go through the online process mentioned above. Hello do you know how to contact bdo nomura? Hi Junelyn, i have updated the post to share the link for their contact details. They have email and phone support. Thanks! What can i put in listed company ang broker dealer. It say needed to fill up. Hello sir.. I just want to know what type of stocks will be applicable for this trading account, ist it for all types? Will I be in control in deciding when, what and how much stocks to buy? Hi Michael, You will be able to buy all stocks available in Philippine Stock Exchange. Hi sir Omeng, i’ve see your name all over my research with regards to investing. You are so generous in answering inquiries. God bless you more! Thanks Emilrose. Also download this ebook >> quick guide to investing in Philippine stock market. Thanks for your site because of this I was able to start stock trading. I am just a newbie with a very limited knowledge. Yesterday, I already received a confirmation notice on the stocks I bought but till now I am clueless what to do next. Welcome Jen, glad to help you.. and our beloved country. Hi Juan, no required initial deposit. You can open as long as you already have an online BDO account. Normally you can start buying stocks after funding with as low as 5k pesos. I’m planning to create an account on BDO NOMURA since I got saving account in BDO. I’m still doing my research on stocks and will mostly appreciate it if you give advice for newbies like me. ☺ Thank You. update: after pile of research :D. I’m now investing in stock market using BDO Nomura. Thank a lot Omeng. That is great to hear Baron.